The World Economic Forum will be convening in Davos, Switzerland from January 17-20 2017. High atop a mountain the world’s most powerful people will be planning your future, or lack of a future. Main themes this year will be global security, replacing you with robots, countering the global nationalist uprising and of course climate change. Lofty words will be spoken and fine wine will be drank! What do those words actually mean for the average person? One could be forgiven for not understanding the language the Globalists speak, with pleasantries couched in mundane terms all in the guise of saving the world. It is almost a foreign language meant to confuse the worlds population which aren’t meant to understand such complex issues. Unwashed masses shouldn’t bother themselves with how tomorrow is being shaped. RaptormanReports thought it would be entertaining to provide a translation for those of us that do not speak Globalist and are not high upon a mountain top looking down on the rest of humanity. Mastering the Fourth Industrial Revolution actually means replacing you with robots. It is estimated that in the next 10-20 years 50% or more of all jobs will be taken by robots. Occupations most likely to be affected are cashiers, factory workers, marketers, lawyers, costumer service, food workers and every other service economy job that people were to live on in a post industrial society. All of the free trade agreements that gutted manufacturing in the west were brought to you by the very same people high atop that mountain in Switzerland. Now they are going to master the 4th industrial revolution, makes you feel warm and fuzzy all over. If anyone thinks the Davos crowd is gonna just let everyone lay around and collect a welfare think again. The idea of a Universal Basic Income being kicked around at this year’s Davos meeting is only a means of further corralling mankind. Anyone who thinks the government would just give money away with out a lot of major strings attached is insane. Global security will also be on the table at Davos. We all know what this translates to! A highly controlled mass surveillance society and a global command structure with the wealthiest .01% perched on top. Individual rights are a thing of the past as governments around the world militarize against their own people in the name of fighting terror. Everyone knows these are just means to an end. The end being “maximum security” around the world. Read the 2016 Davos report entitled Security Outlook to 2030: 3 Alternative Scenarios. Check out the uplifting artwork detailing the three chapters or possible futures envisioned. Each of the three envisioned futures by the World Economic Forum. The world economic forum is merely the public face of an already established command structure representing 50% of the wealth of the world in the hands of 62 families as an Oxfam study recently noted. Acting in concert these globalist cartels control or influence nearly all corporations, banks, governments and media. Revealed – the capitalist network that runs the world From Swiss Federal Institute of Technology in Zurich. This was a scientific study showing these banks and corporations form the hub of a global combine that exert a controlling influence over the global economy. All will be at the annual Davos Meeting. 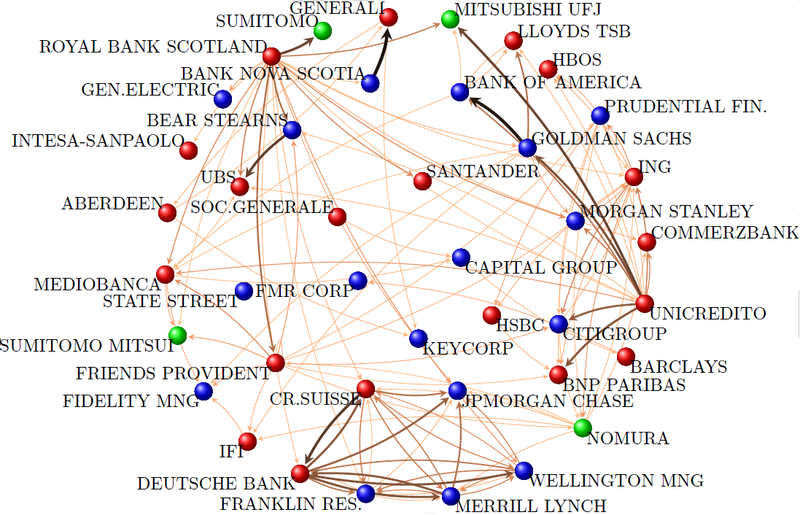 Main hub of financial interests that control global economy. All will be at the World Economic Forum meeting in Davos, Switzerland. Climate change, formerly known as global warming, fits the bill as the main con being pushed by the world economic forum to actually be able to tax you for breathing! Lowering your carbon footprint is for the masses not for the jet setting elite. You are to blame for all the worlds problems and you will pay in the form of carbon taxes. Of course there will have to be a world authority to oversee this and the Rothschilds already have a bank set up for this purpose, how convenient. Al Gore wants to save the world so much he formed a carbon trading firm nicknamed Blood and Gore. Bill Gates and his buddies just want to help. Nice people with your well being in mind. Of course one the main issues at this year’s World Economic Forum meeting will be how to strike back against the populous voter uprising taking place in the U.S., Britain and the European Union. Nationalist movements across the world have sent the Davos crowd into a panic as their plans for world government are crumbling. The Precariat is a permanent under class described by globalist economist Guy Standing who also promotes the Universal Basic Income . The Precariat replaces the old communist idea of a Proletariat as an underclass on a global scale. The Proletariat placed in a precarious position by globalism. Created from inequalities of the global system, this population is to be considered the most dangerous group as they will not be willing go along with the program for further globalism. In fact they may choose nationalist politicians who oppose the goals of the World Economic Forum . Therefore the Precariat must be dealt with immediately. One can only imagine the secret meetings dealing with these issues. Public Private Partnerships – The very definition of fascism is the merger of state and corporate power. Liabilities and debts are public, profits are private. Non Governmental Organization – Foundation paid useful idiots who do the bidding of the U.N. Privatization – Handing publicly built infrastructure over to multinational corporations for pennies on the dollar. Stake Holders – Not you! Consensus – Excluding anyone you don’t agree with. Governance – Complete control over your life by unelected technocrats. 1 Comment on World Economic Forum 2017: What it Means for You.